Quinn Cook Signs 10-Day Contract With Dallas Mavs : The Two-Way It's the first regular season call up to the NBA for the 23-year-old point guard. For the past season and-a-half, he's been playing in the D-League — pro basketball's minor league. 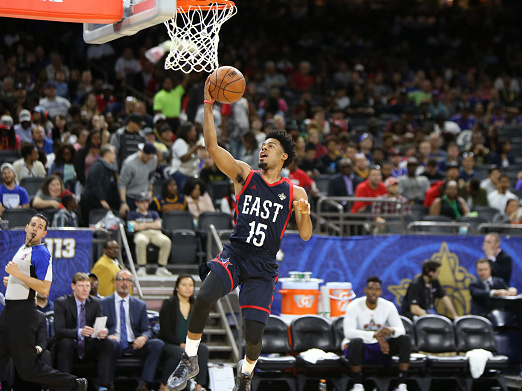 Quinn Cook No.15 of the East Team drives to the basket during the NBA D-League All-Star Game as part of 2017 All-Star Weekend at the Mercedes-Benz Superdome on Feb. 18, 2017. The world of professional sports is a revolving door – athletes come and go. Sunday, there was an arrival in the NBA that resonated a bit more. Twenty-three-year-old Quinn Cook signed a 10-day contract with the Dallas Mavericks. For Cook, a personable and popular player, it's his first regular season call up to the NBA. For the past season and-a-half, he's been playing in the D League — pro basketball's minor league. NPR chronicled Cook's season last year with the D League's Canton Charge on the podcast "Embedded." Cook, a guard, became nationally known to basketball fans when he helped Duke win the 2015 men's college basketball championship. He was a senior starter on that team. After winning the title, three members of Duke's starting lineup were picked in the first round of the NBA draft. Cook wasn't drafted. In "Embedded," he talked about breaking down after watching the draft at his mom's house and not hearing his named called. But Cook has made the most of his D-League experience. Last year, he was named Rookie of the Year, an honor that earned Cook praise from Lebron James, the superstar for Canton's parent club, the Cleveland Cavaliers. Cook also had some near, late season call up's to the NBA. This season, Cook was second in scoring and, at the recent D League All-Star game, he won the Most Valuable Player award. Speaking Sunday from Dallas, Cook said he "definitely" has played better this season – the result of hard work, a year of experience as a professional and the fact that he didn't get called up to the NBA his first season. "I had the motivation of not getting where I wanted to," he said, "and I trusted myself to go back to the D-League." Undrafted players like Cook often head overseas where they can make more money than a comparatively paltry D League salary. But while the wallet gets fatter overseas, the exposure and chance of getting called up to the NBA isn't as great. It was recently reported Cook turned down a $300,000 offer to play in Europe last summer, so he could stay in the D-League. Cook said the story was wrong. "I had [an offer] that was way bigger than that from a team in Russia," he said, adding, "I didn't take it because it's not about the money. When you chase the money, you kind of get off track and lose focus. That's not why I play the game. I play to have fun and I play for the dream." Cook's NBA dream certainly is a lot closer after signing with the Mavs. But it's not quite there. If he does well and the team likes him, they can sign him to a second 10-day contract. If, at the end of that, the team still feels the same way, it has to sign him for the rest of the season. "That's the main thing," Cook said, "to make it all the way. So I just take it a day at a time and try to keep advancing. Just keep advancing." Cook will suit up for his first ever NBA regular season action Monday, when Dallas hosts the Miami Heat in a nationally televised game.